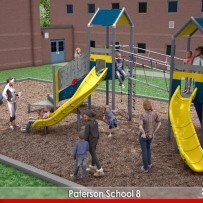 Home » Uncategorized » School 8 in Paterson, NJ is getting a new playground! School 8 in Paterson, NJ is getting a new playground! The students at School 8 in Paterson, NJ, are excited for their new playground. This June the community will join together to build their new Kompan playground in a day. Under the supervision of professional installers, the volunteers will build a new space for the children to climb, slide, spin, and explore. THIS WILL BE OUR 25th PLAYGROUND DONATION! !